This is one of my favorite little easy appetizers and I wanted to post the recipe because it is a really great finger food for holiday entertaining or perfect for watching football. This recipe is from The Party Guys who had a Food Network show several years back. I have been making these for a few years now and they are always a hit. Seriously– give them a shot and see what you think. I bet they become regular rotation for you- plus they are so easy to make ahead and keep in the freezer. 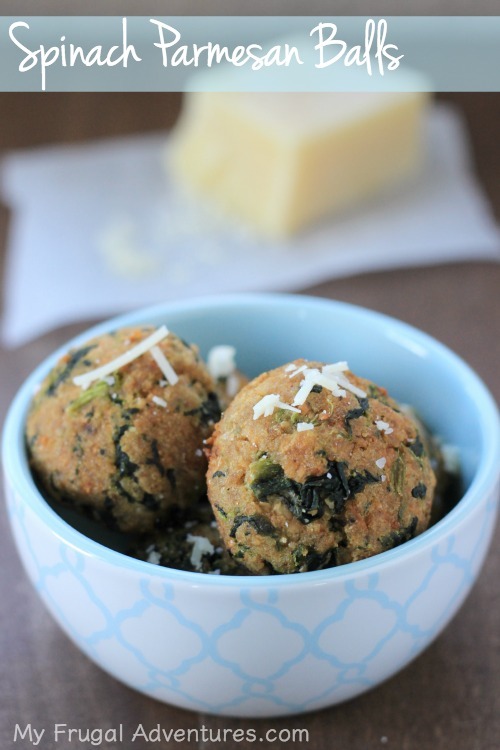 Delicious little bite size Spinach Parmesan Balls. A perfect appetizer for entertaining! Thaw frozen spinach in microwave in a large bowl. Place spinach on top of a clean kitchen towel or paper towels and squeeze out excess water. You can get ½ cup or more. Add the remaining ingredients and mix with a spoon or your hands. Form the mixture into balls- about 1 inch or smaller (so they are bite sized) and place on the baking sheet. Sprinkle kosher salt over the top of the balls. Bake 20-25 minutes until firm and golden. So a few extra notes. 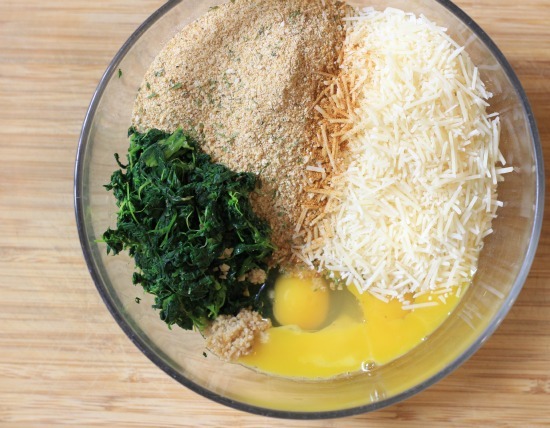 The first is to carefully measure the bread crumbs because you don’t want to add too much and dry out the spinach balls. The next is to take a minute and shred the spinach. 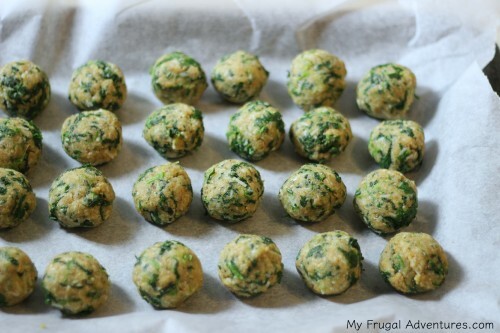 If the spinach is clumpy the balls won’t look as appealing or taste as good. I like to lay it out on paper towels and use a fork to sort of spread it out so it mixes easily with the other ingredients. Oh and see the bowl on the right- that is all the water drained from my package of spinach so it is important to squeeze the water out. This is what it looks like all mixed up together and this is the messy part. I just man up with my hands but if you have gloves that is better. If you want to freeze these just take the bites after you salt them and place them on a plate or I use a pie dish. Pop in the freezer for a quick fast freeze. Then get them out and place in a freezer bag. Oh and one last thing is that when you make the bites be sure the size is uniform so they cook evenly. And a yummy plate of salty, bready, parmesany perfection ready to go! If you try these please come back and let me know what you think. I like these just like this but you can also try dipping them in marinara sauce (here is a delicious crock pot marinara sauce recipe). 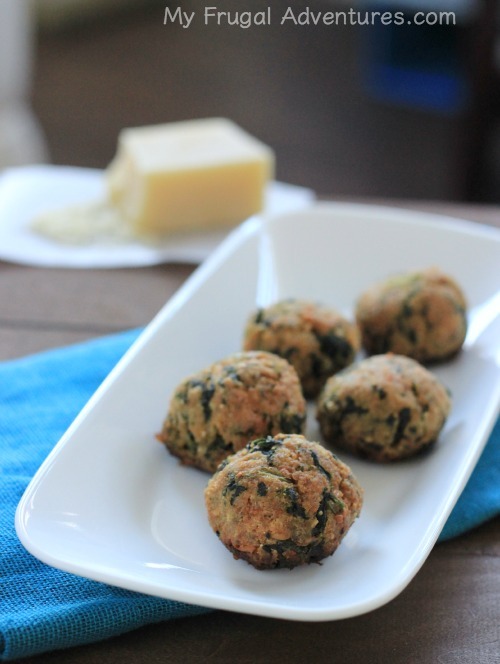 Some people serve these spinach balls as a vegetarian alternative to meatballs in spaghetti. And you might also want to check out my easy Crock Pot French Onion soup recipe! This is vegetarian or make with beef broth. Dumb question – do you reserve and use the water to mix with the other ingredients? Or dump the water? These look so yummy!!!! Thanks! Thanks for sharing! These look great! I am always looking for healthier, easy, make ahead appetizers. If you make them ahead & freeze, can you bake them from frozen? If so, for how long? Brenda,interestingly the time doesn’t seem to change for me when they are frozen vs fresh. Emily I am so glad! And don’t you feel good that there is Spinach going into that little tummy. Charlene – I want to tell you how much I appreciate that you posted this particular recipe. The pediatrician recently told us that my teen daughter has low iron. She is not a picky eater at all, and we eat pretty healthy so I was surprised. This recipe came at the perfect time. I made them and they were absolutely delish!!! I love that the ingredients are typical things you have at home all the time. This is going to be a weekly dish for sure. If you are going to freeze them, do you cook them first? Joni, I don’t cook them. I freeze them raw like you would cookie dough. Charlene, I made a double batch of these for a potluck lunch at work. Everyone absolutely raved, and at least 5 people asked for the recipe! I even had a request to make them for a party. Thanks again!!! Just made a batch for a football game party tomorrow. I froze them but cooked one just to try!!! 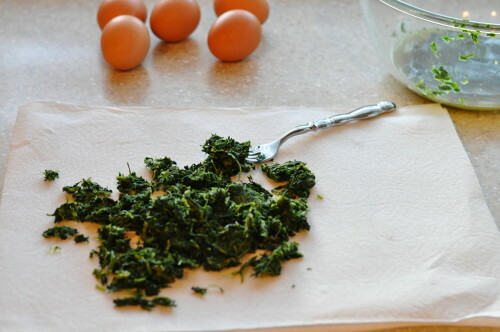 OMG….I will be at the store in the morning for more spinach to make another batch. These will go fast!! So yummy and dipping them in marinara puts it over the top :)! Thanks for recipe!! We are low carbing here..do you know of a substitute for the bread crumbs by chance? Hmmm… Sorry Kristen I can’t think of a substitute. The bread crumbs help hold everything together. just wondering if anyone has tried using fresh spinach? If so, how much did you use? For those of you who eat less healthy, I bake these in mini muffin tins placing each of them on a pepperoni piece. Hi Carole- I haven’t tried fresh breadcrumbs 🙂 Just packaged. I am going to try quinoa instead of breadcrumbs and I wonder if I could use coconut oil instead of all that butter? what do you think? Try to make it more healthy. Thanks for the great recipe idea!! Holly- hmm.. I would love to hear how that turns out. I am not a fan of quinoa myself so I don’t use it often.